First of all, when we talk about internet security, it has become a very big issue nowadays as people around the world are increasingly implementing internet into different fields and the demand internet security is increasing by day. Nowadays, hackers break into people’s computers and get away with their valuable data and personal details this trend have also increased the rate of other cyber-crimes the data phishing and identity thefts. So, people are looking for ways to protect their computers. Many people use PC based firewalls, antivirus and antimalware like tools but you have to keep in mind that all those tools can only protect the files residing inside the computer. Once the file has left the computer, these tools cannot provide protection to it in the cyber space. So, that’s where hackers target and succeed into getting hold of that data. VPN is Not an Option: It’s a Necessity! That is why to protect your data from hackers and spammers, you will require a reliable solution that will completely ensure the protection of your data. 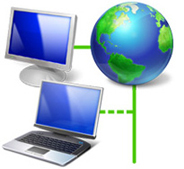 VPN is that tool, as it ensures that you data travels through the internet safely. A VPN or Virtual Private Network is capable of providing robust online protection and it is highly recommended that you get the best SSL VPN service because it will create an encryption between your computer and the remote server located in a country of your choice. So, that is how all your data will be kept safe and protected from any third parties including hackers, spammers and even your ISPs. A VPN connection uses different protocols, like L2TP, PPTP, SSTP and OpenVPN protocols. SSTP and OpenVPN protocols are based on SSL. Now you have to keep in mind that if you are planning to get a VPN connection for your computer running Windows, then you can get any of the above VPN service but you have to keep in mind that in mobile devices like iPad, iPhone and other Android devices, only PPTP protocol is supported and if you want to use a SSL protocol on your mobile device then you will have to undergo a little complex modifications to your device. How Does SSL Protocol of VPN Work? So, as I mentioned above, SSL connection uses the tunneling technology to transfer all your data through the internet. Once you send the data, it is encrypted and when it is reaches the other end then it gets decrypted to make sense. In the meantime no one can get their hands on that encrypted data and no one can decode it. So, once you get a SSL connection, you will never have to worry about protection of your data travelling through the internet. SSL VPN is Best for Business! We have often seen that business users like SSL VPN connection more because it fulfills their needs of safety and protection, but on the other hand individual users also like to get SSL VPN due to its so many advantages. There are many VPN service providers that provide high quality VPN services and also offer SSL VPN. Here is the list of some of our highly recommended SSL VPN providers.